The sound of Mine Blocks 1.24 is ringing to attract fans of Minecraft game. 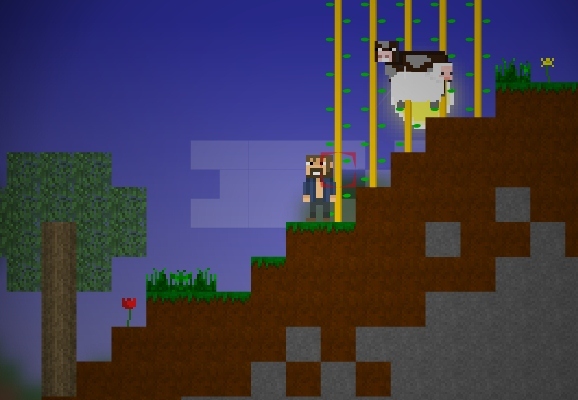 Mine Blocks 1.24 comes out with these following features- sticks with carrots on, hats made with Santa style, machines made of snow that behave like humans, blocks made of bamboo, and vegetable matters like mushrooms, shrubs, and sugar canes. In addtion to basic and traditional recipes, a recipe of mossy cobblestone is added. Materials, animals, and enemies are upgraded too. For example, if we want to take wool from sheep, they must be killed or sheared. Interestingly, once sheep eat some grass, they are able to grow again. About spiders, when spiders jump, it is a signal that they are attacking. The list of new features in Mine Blocks 1.24 has not ended yet, and they are shown rather in details by the author. Hence, players may spend some time on reading and taking notes a whole list of tasks and features of the game as well. Besides other games like strategy, action, party, racing, skilling and mathematics, games about adventure seem to be in top of popular games which are played by a large number of players. Adventure games lead people to a new land filled with unexpected and unknown things, people, or enemies. Since unknown things and treasure tend to make humans curious, it is not easy for anyone to deny the attraction of adventure games. Among adventure games made by different authors or producers, recently Minecraft games have made a strong impression on players because these games put players in a strange place and ask them to build their own place from simple things around them. In sum, Mine Blocks 1.24 inherits typical features from other versions of Minecraft games. More interestingly, when players play Mine Blocks 1.24, they are expected to finish a list of new tasks different from those in other Minecraft versions. It is uneasy to find a game which makes players excited to challenge themselves in a vast world. Maybe it is high time they measured how smart they are. Let see in this version called Mine Blocks 1.24 who will be the first people to accomplish requirements asked by the game. Moreover, ideas and comments are highly appreciated. The character moves with the help of WASD or Arrows. He uses Left-clicking to dig, break, or cut. Seeing tasks is done with T, and receiving help is done with H.
The Inventory is opened with E.